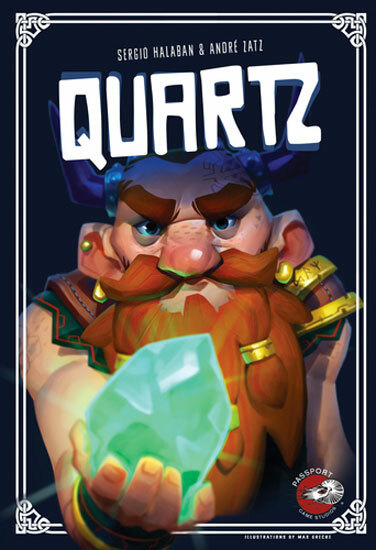 We review Quartz, a new push-your-luck game from Passport Games Studios. In Quarts, players are trying to collect the most money by mining for gems. With a healthy dose of "take that", Quartz has a lot of player interaction. Break out the Scottish accents and the mining puns. Practice twisting the corner edges of mustaches (or imagined mustaches) and fill some tankards with inebriating beverages (or root beer). And don’t forget to brush up on bag groping skills. They’re needed to play Quartz, a new game from Passport Games Studios. 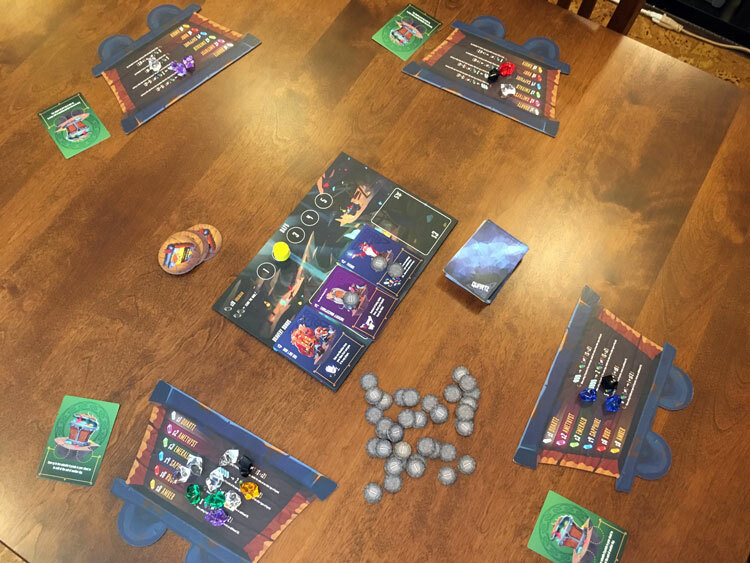 Quartz is a push-your-luck, set collection game for 2-5 players that takes about 45-60 minutes to play. It plays best with 3-4 players. Players take on the role of dwarves venturing into a dangerous mine with the aim of collecting the most valuable gems. This is accomplished by selecting plastic gems from a bag, hoping to retrieve the rarest gems while trying to avoid obsidian (black) gems. Each round, a player’s selections add points and the most points at the end of five rounds wins the game. The main board is decorative, but really only serves as a holder for the cards and the round marker. The bits for Quartz are fun and set the right tone. A large black cloth bag with large plastic gems represents the mine. Player boards are shaped and decorated like mine carts with reference material for scoring. The cards are distinctive and easy to understand. Finally, the art is comedic and appropriately represents a light tone of dwarves maneuvering against one another to collect gems. 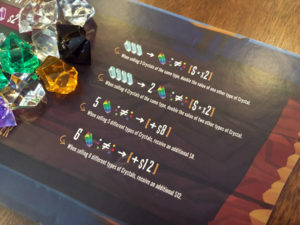 Player boards show reference information for the scoring of gems at the end of a round. Draw a Gem from the Bag – A player pulls a single gem from the bag and adds it to their minecart board. 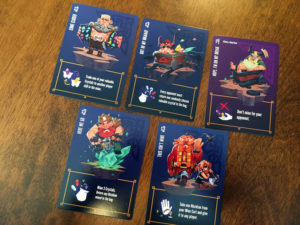 Play an Action Card – Using an action card from their hand allows a player to manipulate the gems of other players or draw more efficiently from the bag. If players have counter-cards, they can use these to cancel a player’s card. Leave the Mine – By exiting the mine earlier than others, players can collect additional action cards from the main board, potentially as well as a couple coins. If a player ever has two obsidian gems, whether from drawing or from an action card, then they have an “Accident” and leave the mine without collecting an extra card. They also lose all their gems for the current round. They then receive a token which allows them to remove an obsidian from their cart on later rounds. At the end of the round, players calculate their scores from their gems. Collecting multiples of a single color or single gems of all different colors allow for bonuses. Play proceeds each round until all dwarves leave the mine through accident or otherwise. At the end of the game, cards in hand add to a player’s points when the total scores are tallied. During play, it’s not unheard of for a player to get particularly lucky (bottom) with their gem draws. The first thing to remember about Quartz is that this is meant to be a light-hearted, fun, and often mean, game. 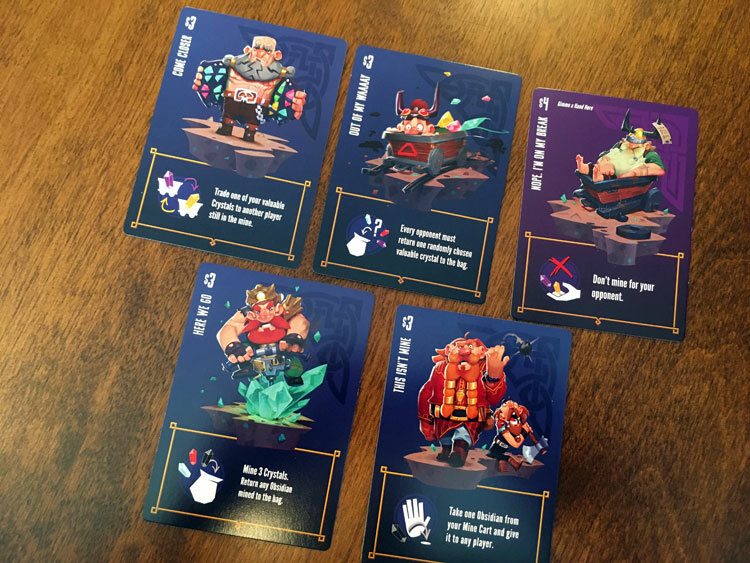 Cards are quickly played to take gems from other players or give them obsidian. Turns go by fairly fast, and generally, the spirit is jovial without difficult decisions to make. However, when a player leaves the mine, they’re basically sitting out of play until the end of the round. This is the time to go grab a drink refill because the downtime from this is significant. If a player happens to leave the mine early in a round, there’s nothing to do but wait for the other players to finish. This downtime isn’t something that would happen rarely, it’s common and it’s the major negative of the game. Sure, this is a game with a lot of luck involved, but it also means that through no fault of their own, and without much recourse, a player can draw successive obsidian gems. This waiting isn’t a problem for players with some patience, but as this could also be considered a family game, playing with impatient family members is problematic. The action cards are drastic and can be quite mean at times. 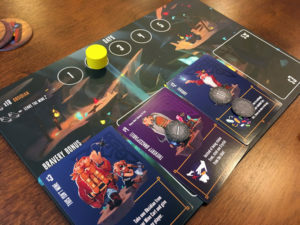 The other issue is that when the play comes down to just two players left in the mine, only the player who leaves last receives a card from the main board. As this card reward is called a “Bravery Bonus” it begs the question why the second to last player doesn’t receive anything. The second to last player is also acting brave by staying in the mine, but it’s clear the intent is to ratchet up the tension for a competition for the final card on the main board. However, the rewards from these cards are not nearly enough to press the game engagement. There are so many other ways the game could be improved in this respect, that this mechanism feels underdeveloped. The main engagement more often comes from the mystery of the bag draw, and there, most importantly, the game succeeds. 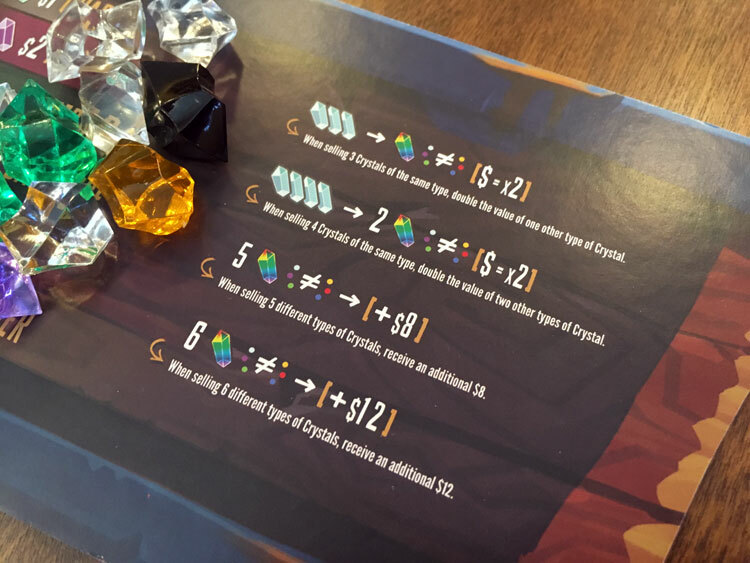 Players who draw valuable gems immediately become a target for thievery or sabotage. Staying in the mine longer to collect sets of different kinds can really boost a score. This is the kind of push-your-luck tension and potential for backstabbery that makes light games memorable. Quartz is a fine game. It fulfills, mostly, what it intends to do. It’s just not the best at what it wants to do. The card play feels lacking and the round-end bonus lacks tension for a push-your-luck game. On the whole, it is enjoyable and the take-that aspects to the game really prop up the experience. If you’d like to pick up a copy of Quartz, you can get it for about $20. 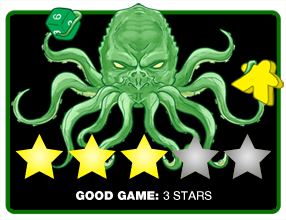 Final Score: 3 Stars – Unrefined card play and bonuses mar a simple push-your-luck game that stays enjoyable enough.